Whether for security or privacy reasons, but we can all benefit from a little bit of VPNing every now and then. Traveling and using random hot spots, avoiding snooping or traffic shaping etc. There are many valid use cases for VPN. On my devices, I have always used OpenVPN. It is simple to set up and it truly is rock solid. It works on all the platforms I need MikroTik, Linux, FreeBSD, Windows, Mac and iOS. It also helps that you can use either udp or tcp and whatever ports you’d like. Indeed it is so flexible, that most (if not all) of the commercial VPN providers actually use OpenVPN and just provide “easy to configure” clients for it. And there is certainly merit for that. I mean setting up OpenVPN client on an iOS device, requires you to somehow transfer the certificates to it and just, in general, I find it cumbersome. I even wrote a blog about it so I could remember how to do it. Anyways, the title is L2TP FTW, right? 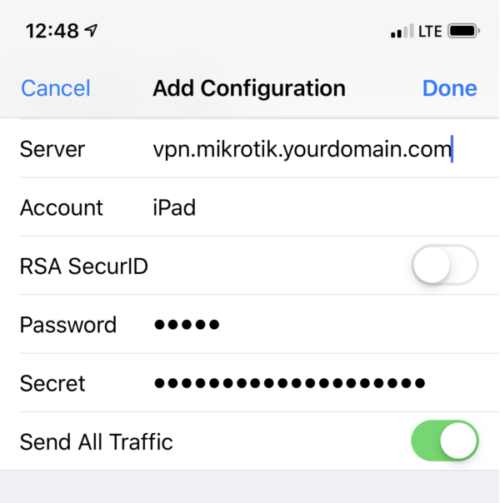 So yeah, I was setting up a new phone and laptop and again, had to go through the pain of remembering how to do it and deal with the certificates, when I realized that there is another option – L2TP, it is dead simple to set up on MikroTik (the brand of routers I use) and as it turns out, the client functionality is built in to all the systems I use – iOS, macOS and Windows. Setting it up on the client side only requires you to type in the server name and the credentials. This is way more convenient than fiddling with the OpenVPN profiles. So I guess the message here is – if you are not the biggest fan of messing with OpenVPN profiles, give L2TP VPN a try. For server <-> server I’d still always opt for OpenVPN, but for client <-> server, I have been using L2TP for some time now and it works great.